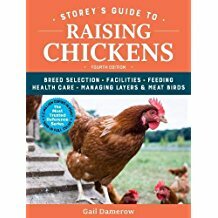 Storey's Guide to Raising Chickens has all the information you need to successfully keep chickens, from choosing breeds and hatching chicks to building coops and keeping birds healthy and safe from predators. This thoroughly revised third edition contains a new chapter on training chickens and understanding their intelligence, expanded coverage of hobby farming, new information on avian influenza and fowl first aid, and much more! Gail and her husband operate a family farm in Tennessee where they keep chickens, guinea fowl, turkeys, rabbits, and dairy goats. Damerow writes extensively on livestock raising and is a regular contributor to Backyard Poultry magazine.